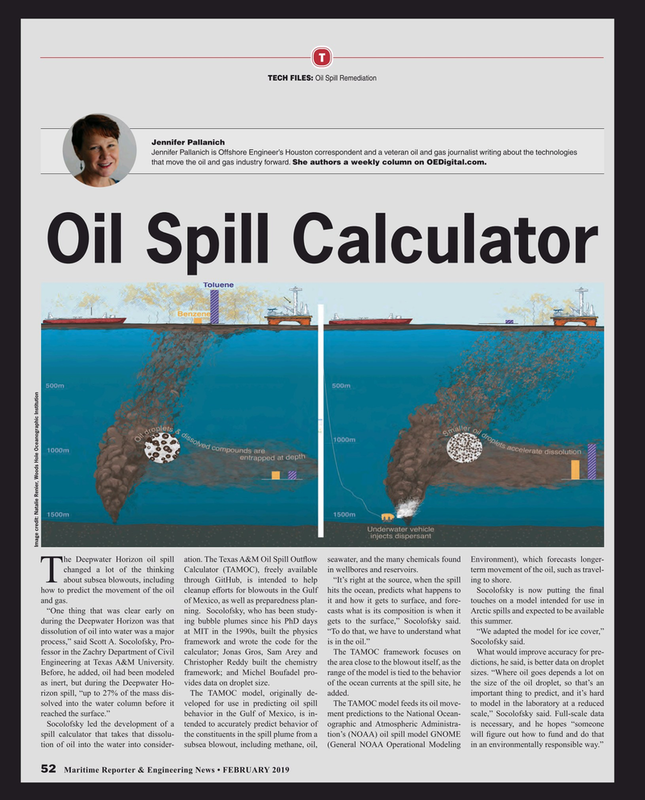 Jennifer Pallanich is Offshore Engineer’s Houston correspondent and a veteran oil and gas journalist writing about the technologies that move the oil and gas industry forward. She authors a weekly column on OEDigital.com. Tabout subsea blowouts, including through GitHub, is intended to help “It’s right at the source, when the spill ing to shore. how to predict the movement of the oil cleanup eforts for blowouts in the Gulf hits the ocean, predicts what happens to Socolofsky is now putting the fnal and gas. of Mexico, as well as preparedness plan- it and how it gets to surface, and fore- touches on a model intended for use in “One thing that was clear early on ning. Socolofsky, who has been study- casts what is its composition is when it Arctic spills and expected to be available during the Deepwater Horizon was that ing bubble plumes since his PhD days gets to the surface,” Socolofsky said. this summer. dissolution of oil into water was a major at MIT in the 1990s, built the physics “To do that, we have to understand what “We adapted the model for ice cover,” process,” said Scott A. Socolofsky, Pro- framework and wrote the code for the is in the oil.” Socolofsky said.